“Some names attract songs and some don’t. 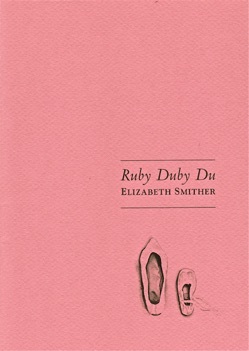 Ruby Duby Du is a suite of 28 delightful poems written by Elizabeth Smither for her granddaughter, Ruby. They begin with conception and end with a family gathering where Ruby counts stars. They progress through an amusingly competitive grandmother and grandfather, sleeplessness, an heirloom dress and Ruby at an Italian restaurant where she takes a bite out of a polystyrene pillar – the day to day life of a little girl and her grandmother. Elizabeth Smither, who has been New Zealand poet laureate, Hon D. Litt (Auckland) and winner of the Prime Minister’s award for Literary Achievement in Poetry 2008, says that none of these compares with being a grandmother. With 7 small watercolours by Kathryn Madill, a printmaker and painter who occasionally strays into the world of publishing with an image or two. –Paula Green, NZ Poetry Shelf.